We now turn to the individual performances of 2016 that drew our ire and scorn. These were the actors who found themselves in roles they couldn't crack, weren't right for, or just simply exposed their lack of talent. There's a bit of theme to this year's top 10 – let's see if you can spot it. Jesse Eisenberg drew raised eyebrows right off the bat for his casting as Lex Luthor in Batman v Superman, but hey, playing him as a deranged version of his Mark Zuckerberg role in The Social Network had promise, right? Right? Wrong. 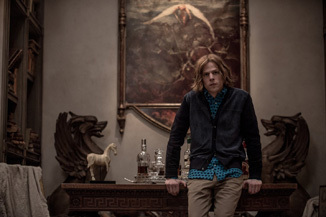 Jumping around on screen like a crack monkey billionaire with a theatrical flair that Cesar Romero would have told him to tone down, Eisenberg would have single-handedly made BvS one of the year's worst acted films except for all the help he had (wait for it...). Second place goes to his compatriot in the film, Henry Cavill, a terribly wooden actor who thankfully didn't have a crucial role in BvS, playing the minor character of Superman... oh, crap, he was supposed to be a lead? Did no one tell him? Doubling down on his dour, basically expressionless performance from Man of Steel except for moments of “GRRR Face,” Cavill was basically lost in a role much bigger than his capabilities and unfortunately left a big gaping hole at the film's center. Switching gears slightly for a second, we move to DC's other big summer film, with Jared Leto and his role as The Joker in Suicide Squad. Now, much has been made of the fact that Leto had a much more substantial role that was cut during the film's numerous retoolings, but if anything, this was a gift to Leto, as more of his Hot Topic Joker being seen would only have done further damage to his career. A one-note, meth-addled performance, it had all the bite of a toothless raccoon instead of the menace or malevolence that we've gotten out of previous iterations of this character. Thanks for ruining everything, 2016! He's paired up with another Suicide Squad actor, Joel Kinnaman, who finished fourth in our voting. As the military minder for the squad and the indirect reason everything in the movie started in the first place, he's given a bit of a thankless task as the “straight man” of the movie. Faced with that job though, he didn't even really try, struggling with an accent and emoting and presenting the illusion that he was a real human being with feelings and desires and such.